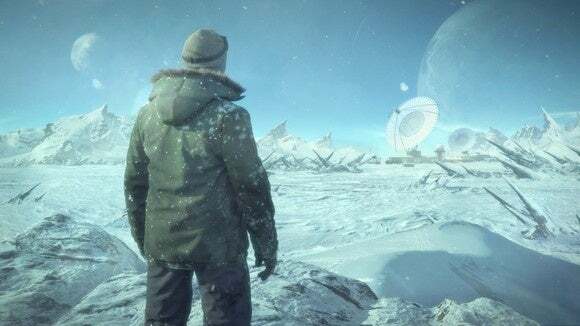 We take a look at Beyond Earth's first major expansion. Civilization fans (should) know the drill by now. Year One: Firaxis puts out competent, but sparse, base game and people complain it’s not as good as [Previous Civilization title]. Year Two: Firaxis releases the game’s first expansion, adding a few new factions and technologies and at least one notable new system. 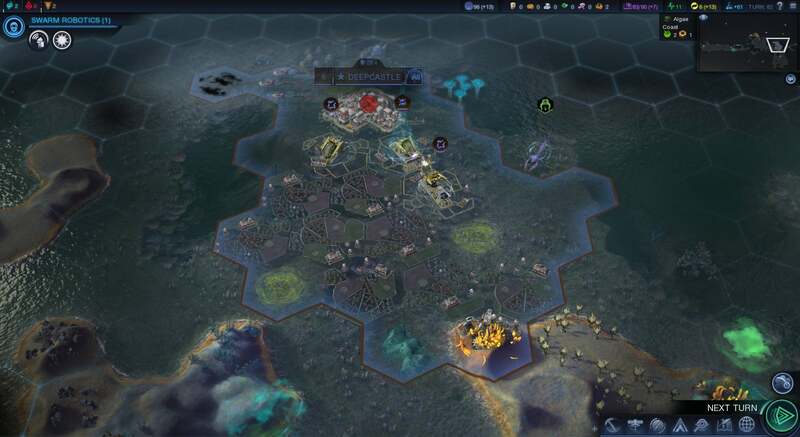 Year Three: Firaxis releases the second expansion, which fills all the gaps and fixes all the half-broken systems. Many go on to proclaim it “The Best Civilization Game” and forget how much they initially complained, setting up the cycle for next time. With Civilization: Beyond Earth - Rising Tide we find ourselves in part two of the three-part cycle. 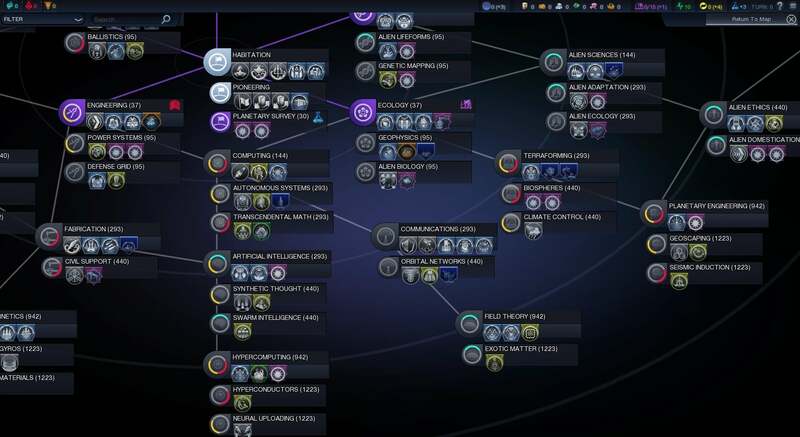 Here’s what I think of Beyond Earth’s first expansion. As implied by the title, Rising Tide is a nautical-themed expansion. And it makes sense Firaxis went here, I think. Why? Because this isn’t just “Alien Submarines” and “Alien Clipper Ships” and “Alien Aircraft Carriers,” though those types of units are part of the expansion. But no, the key new feature in Rising Tide is aquatic cities. You can now found a city on coastal (or, if you have the right technology, ocean) tiles instead of on land. Aquatic cities don’t expand through culture like your usual land-based cities. Instead, you can gear production towards moving your city, one hex at a time. Upon moving, the city takes over all six hexes in its immediate vicinity—any it didn’t already own. You also keep any hexes you’ve left behind. So far, I’ve found this typically means a slower start for aquatic cities—it’s an arduous task to move your city in the early game, and spending energy to purchase hexes can only get you so far. Late in the game you’ll reach a point where it takes only a single turn to move your city though, which can be really crazy provided you have a lot of currency lying around to buy up troops when necessary. You’ve basically created a massive floating war factory. ...And you will know us by the trail of hexes. It’s a fascinating system, and I look forward to hearing how people take advantage of it. But more importantly, it’s a wholly unique system that could only really work in Beyond Earth. Thematically, it makes no sense for traditional Civ. And that’s a good thing, because it means Beyond Earth is finding its own footing. 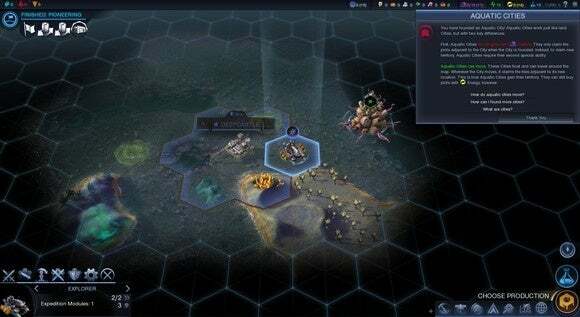 I actually enjoyed the base game a fair amount last year, but even I admitted it felt like a reskinned-and-stripped-down Civilization V. Rising Tide puts some much-needed separation between the two. Just make sure you’re playing a map with a lot of water if you want to explore all the expansion has to offer. I had a ton of fun playing on the archipelago-esque planet “Fungal Tau Ceti D,” but something land-locked would basically negate two-thirds of this expansion—not just the aquatic cities but all the new naval units and aliens too. Those with an aversion to water need not fear, though. Firaxis has done more than fill out the oceans. And to be honest I think the biggest change is going to be the most controversial. We’ll see. Firaxis has overhauled Diplomacy in a big way for Rising Tide, fundamentally changing a system that’s existed in more or less the same form for...oh, twenty years? The tech web is now more colorful, making it easier to spot affinity-related techs. It’s in part a response to the pervasive complaint last year that factions didn’t have enough personality. Sure, there was the “American” faction and the “French” faction and the “Russian” faction and et cetera, but these weren’t people we knew. There was none of the kinship you’d feel in traditional Civ when playing as Gandhi or Washington or what have you. Beyond Earth’s factions were mostly interchangeable. Rising Tide doesn’t necessarily fix this—it adds a few new factions, including some with corporate (instead of governmental) origins, but by and large the figureheads running each are still pretty interchangeable. But it does at least surface what tactics each faction is pursuing. Leaders now have up to four personality traits, divided into categories—Political, Military, Domestic, and one that’s unique to your leader. 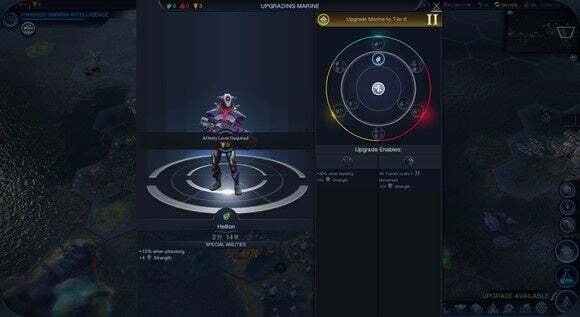 While the unique trait is locked, you’ll choose the other three over the course of the game or change them on the fly to fit your play style. This is all governed by a new currency, Diplomatic Capital, which you earn each turn and which can be spent on units/buildings if you have a surplus. Traits serve a number of purposes. 1) They provide your faction with material benefits. 2) They give you an indication of what aims the AI leaders are pursuing. 3) The AI will base whether or not it likes you based on whether your actions match their traits. For instance, someone with a lot of military-focused traits will gradually start to dislike you if you don’t maintain a large standing army. And they’ll tell you they don’t like it, over and over and over again. It’s a bit annoying, actually. 4) Each trait you choose allows leaders to make “Agreements” with you. This replaces the old-style negotiation system. From the top: A broad range of benefits fall under the Personality system, and I actually feel like some are waaaay overpowered. For instance, my “Insightful” trait, maxed out, gave me 12 Science per turn for each of the five agreements I was able to initiate with other factions, for a total of 60 Science per turn. That’s huge. It took me a while to get to that point, but even at the end of the game that single trait was responsible for about half my Science output alone. I anticipate some rebalancing in the coming months. The second and third aspects are pretty self-explanatory, but let’s dive into the fourth: Agreements. 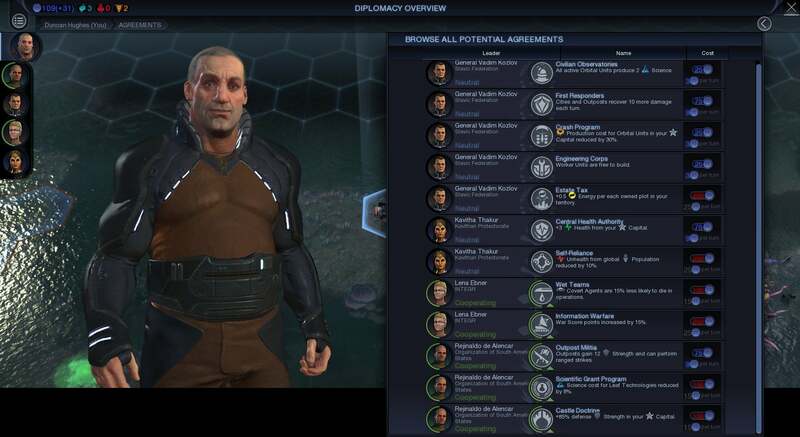 Firaxis has trashed the old “I give you open borders and this technology, you give me this money” system of negotiation. Instead, relations between factions are always in one of five states—War/Sanctioned/Neutral/Cooperating/Allied, and each state comes with its own benefits (i.e. Cooperating allows for open borders automatically). The list of potential agreements gets pretty exhaustive towards the end of the game. 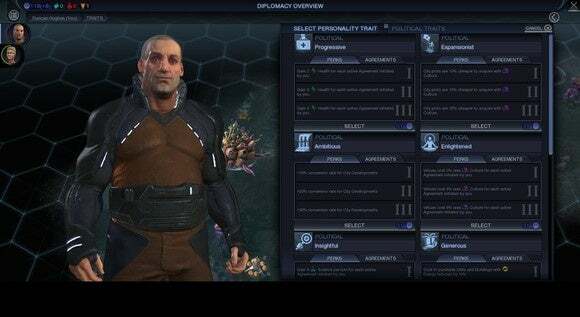 Factions that are neutral or higher can then initiate Agreements, wherein they trade some of their Diplomatic Capital each turn for some benefit, like military units are less expensive to maintain. Agreements are specific to the leader’s traits, so each will typically have different ones to choose from. Basically, it’s a complete overhaul of Diplomacy, and I think it works for the most part—although as I said, certain traits seem way too powerful at the moment. I enjoy it more than the old system though, which always seemed needlessly overcomplicated. The last change is more a refinement than an overhaul. 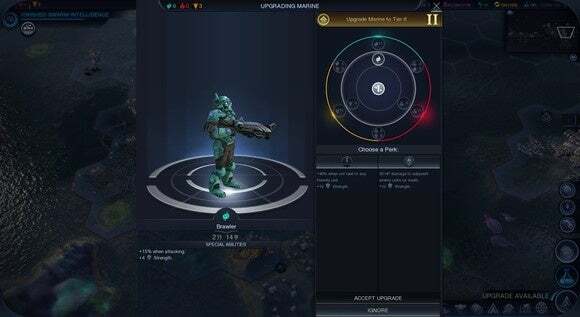 Firaxis has expanded the Affinity system from Beyond Earth to allow for “hybrid affinities.” In the base game, you were basically forced to mainline a single affinity to get the best units and access to the affinity-specific endings. And somewhere between the two. Your cities will also show as blended, such as part-Purity architecture and part-Supremacy. It’s a smart update, although tying three of the five endings to single affinities without adding any for hybrid players feels like a mistake. A few of my complaints from last year remain—the user interface could still use some beautification and the tech web is borderline impenetrable for first-time players. But Firaxis has made some smart choices with Rising Tide. It’s starting to distinguish itself from Civilization V finally, and not just in terms of the way units look. Playing Rising Tide—especially on a water-heavy map—feels appreciably different from previous Civ games. I expect next year’s inevitable second expansion will push the game even further down this route—away from Civilization proper and into something more experimental. Or at least I hope that’s what happens, because it’s exactly what Beyond Earth needs.